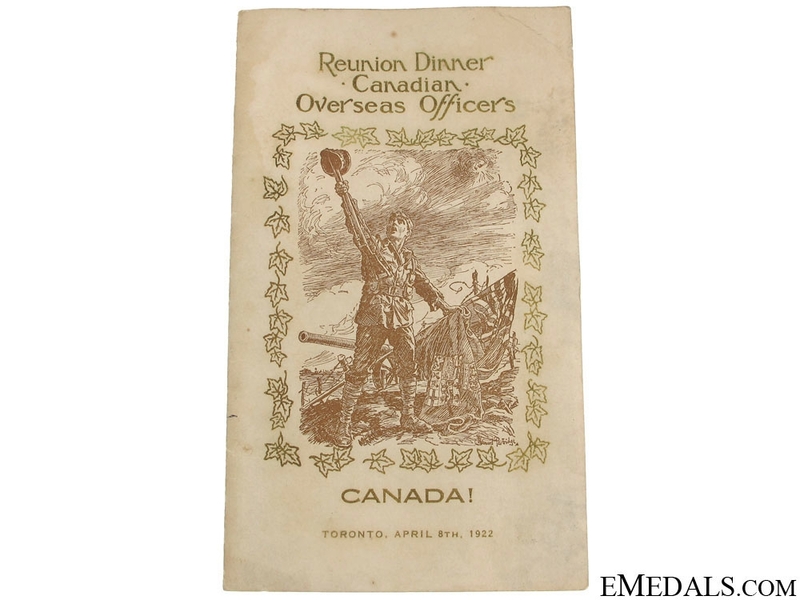 CEF Officers Dinner Programme 1922 - Byng & Currie Signed - Programme has a two-piece construction, cover printed in brown and gold inks on a thick beige stock, entitled "Reunion Dinner, Canadian Overseas Officers" above, inscribed "CANADA!" and "TORONTO, APRIL 8th, 1922" below, with a line drawing in the centre, illustrating a victorious Canadian soldier on the battlefront, holding his rifle aloft with his cap on the end of the rifle in his right hand and holding a Canadian flag in his left hand, surrounded by a cluster of maple leaves on the front cover. 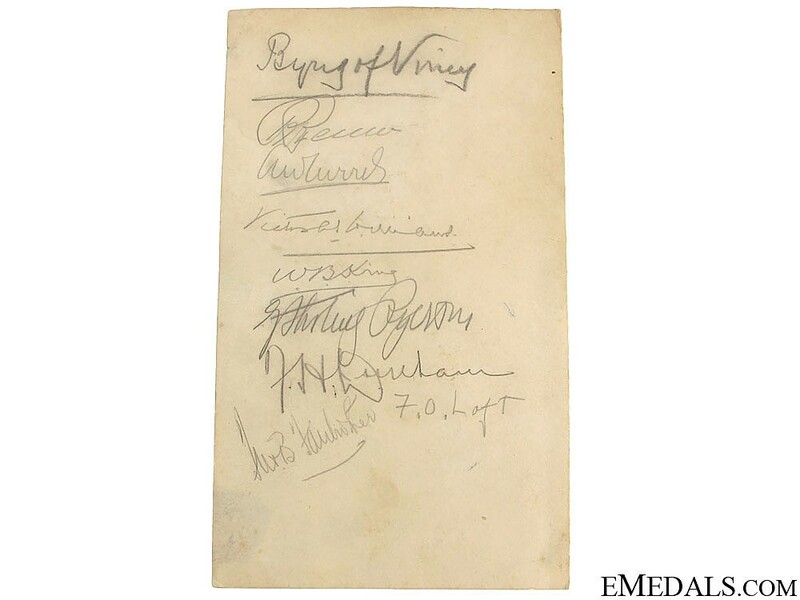 There are nine officers' signatures in pencil on the back cover, the top signature clearly that of Field Marshal Julian Hedworth George Byng, 1st Viscount Byng of Vimy GCB GCMG MVO DCO (September 11, 1862 – June 6, 1935), who was a British Army officer that later served as Governor General of Canada (1921-1926), the twelfth since Confederation in 1867. 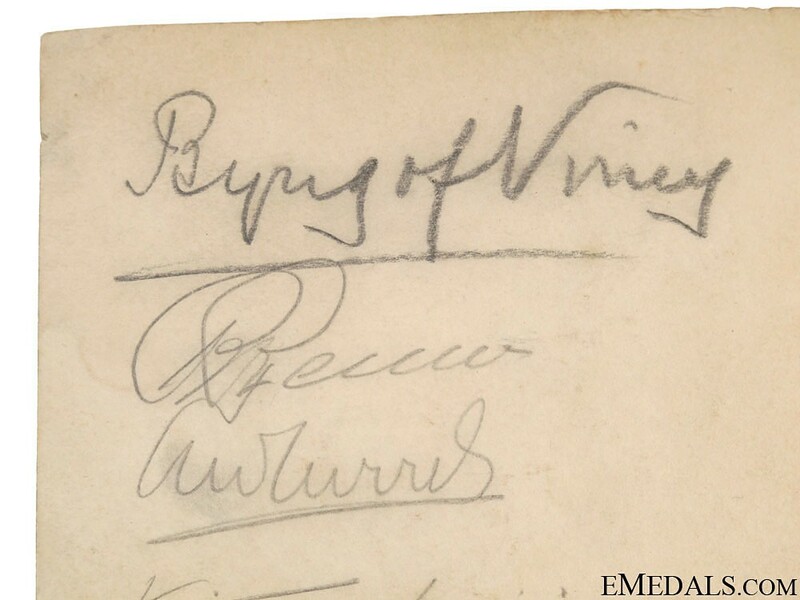 The third signature is that of A.W.Currie - the famous Canadian Corps commander. 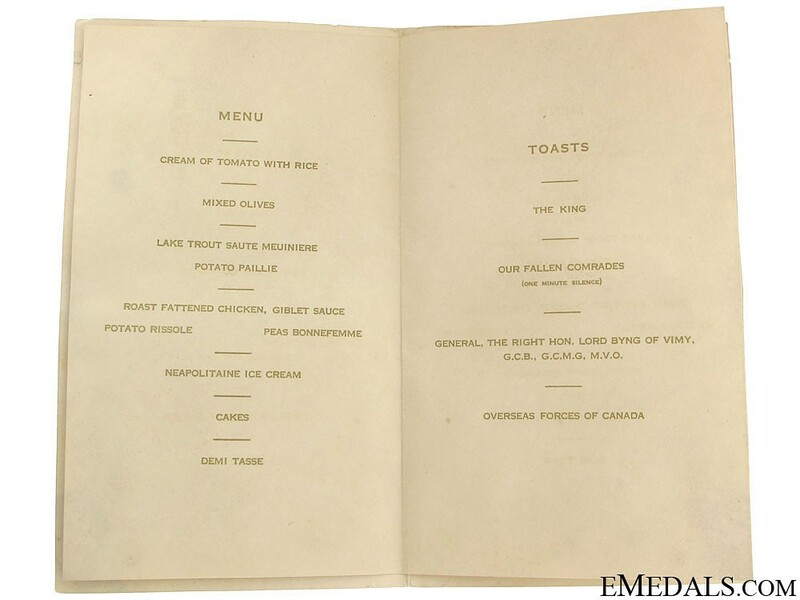 The inside has an insert printed in gold ink on a standard beige paper stock, listing the Menu on the left side and Toasts on the right side, with mention of General, The Right Hon. Lord Byng of Vimy, as the third toast. Insert is glued into position inside the cover, 120 mm x 202 mm, light age discolouration and undulation from previous storage, signatures are very clear, near extremely fine.